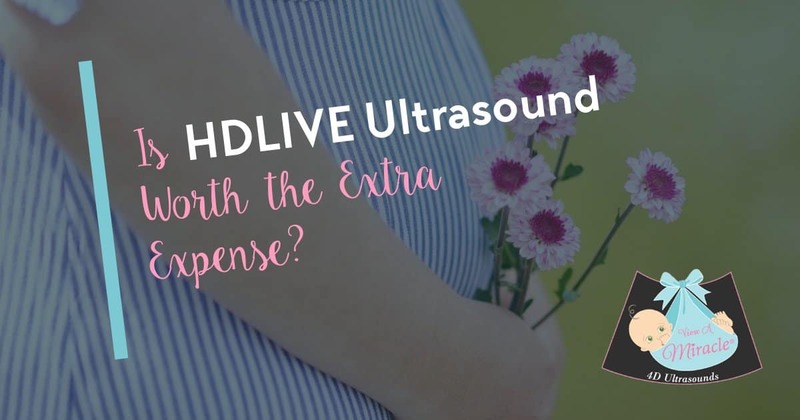 Is HDLIVE Ultrasound Worth the Extra Expense? HDLIVE Ultrasound, also known as 5D Ultrasound and HD Ultrasound, is a recent technological advance that allows for near crystal-clear video imaging of your baby in utero. View A Miracle has a variety of 2D, 3D/4D and 5D Ultrasound package options available which are priced based on the technology being used to capture images of your baby. Let’s take a look at the types of ultrasound available and how HDLIVE Ultrasound is different from all the rest. Allows you to listen to your baby’s heartbeat and view a two dimensional black and white image of your baby. Allows you to see your baby in three-dimensional color. You can listen to your baby’s heartbeat and, in most cases, you will be able to see the four chambers of his/her heart as well as the kidney’s, bladder, spine, stomach and more. Both static and live images are captured during a 3D/4D Ultrasound. HD Ultrasound is the most advanced ultrasound technology available. 5D Ultrasound provides amazingly clear, high definition, three-dimensional, live video images of your baby. If you want to see the clearest live image of your baby, then investing a little more in 5D Ultrasound is the option for you. Our HDLIVE Ultrasound packages are affordably priced and also include 2D and 3D/4D imaging/photos in addition to the live HD video of your baby. Want to learn more? Give us a call and we will be happy to help you determine which HD Ultrasound package is right for you. https://viewamiracle.com/wp-content/uploads/2018/09/1200x630-1DQIIMV.jpg 630 1200 View A Miracle /wp-content/uploads/2019/01/VAM-header_compressed.jpg View A Miracle2018-09-24 22:16:542018-09-24 22:17:58Is HDLIVE Ultrasound Worth the Extra Expense? Alternatives to the Gender Reveal Party What Can I Actually See with HD Ultrasound?